The Dayton Book Fair Foundation has chosen three downtown Dayton nonprofit organizations as beneficiaries of the 2019 Dayton Book Fair. 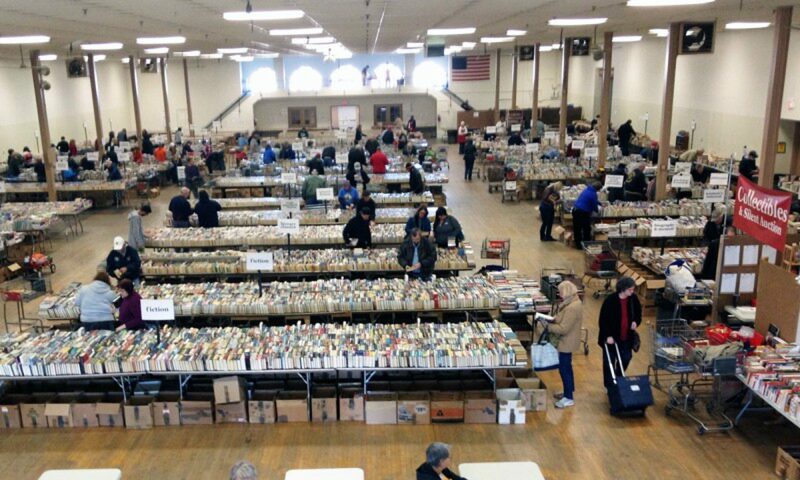 This year’s book fair is the the 49th annual fair, the largest used book sale in Ohio and will generate grants of around $10,000 for each recipient. The three organizations chosen from a large pool of applicants are the Dayton Day of the Dead Festival, the Greater Dayton LGBT Center and Community Action Partners of the Miami Valley. The three groups they picked this year all call downtown Dayton home, and range from a tiny nonprofit to an enormous organization with a multi-million dollar budget. “But just because they’re big doesn’t mean that they don’t need help,” Vonalt explained. That beneficiary, Community Action Partners of Miami Valley has been trying for years to build a bus shelter outside their south Main St. offices to provide a safe, dry place for their clients to wait for the bus. Though their budget is considerable, all of it has stipulations attached, and there was nothing extra to build the shelter.” Community Action Partners is a private non-profit organization that provides assistance with utilities, weatherization, shelter programs, transportation, legal issues, home repair, computer literacy, tax assistance and housing. “The third recipient is the smallest, a group of artists and musicians that for the last seven years have produced (on a shoestring) a marvelous festival and parade celebrating Dia de los Muertos, or Day of the Dead, one of the most important of Mexican holidays,” Vonalt said. Though predominantly Mexican, the holiday is also marked in Europe as “All Saints Day” and focuses on gatherings to remember friends and family who have died, and help support their spiritual journey through parties, parades and the making of altars to honor them. This vibrant celebration at the Dayton Day of the Dead Festival begins with a parade through the Oregon district with huge skeleton puppets, floats, revelers in elaborate costumes (and sugar-skull facepaint and wreaths of flowers), musicians, dancers and children. The parade finishes at the Old Yellow Cab company where festivities continue with story telling, folk dancing, music, more face painting and Mexican and South American street food provided by local restaurants and St. Mary’s Church. The festival is free and family-friendly.